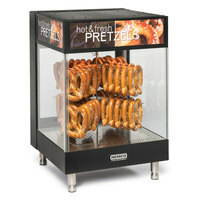 Keep freshly cooked soft pretzels ready to eat by storing and presenting them in a pretzel warmer! Soft pretzels are great on-the-go snacks that are sure to bring in profits because they’re easy to eat while walking around a stadium, carnival, or event. 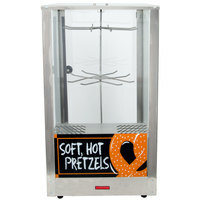 Since each pretzel merchandiser features a visually appealing construction and display, you can increase impulse sales in your snack bar, convenience store, or concession stand. By using a pretzel warmer, you’ll be able to prep soft pretzels before rush hour and keep them just as fresh as when they came out of the oven. 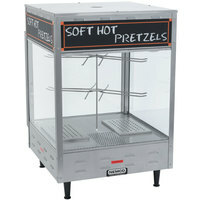 Choose from dual service units that have doors on the back side so you can serve customers, or go with a full service pretzel display case that features doors on both sides, so guests can grab-and-go. 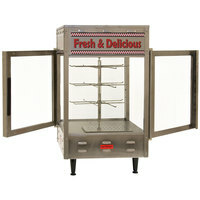 Adding these countertop units to your kitchen supply will ensure that your busy lines stay short and your customers remain happy.